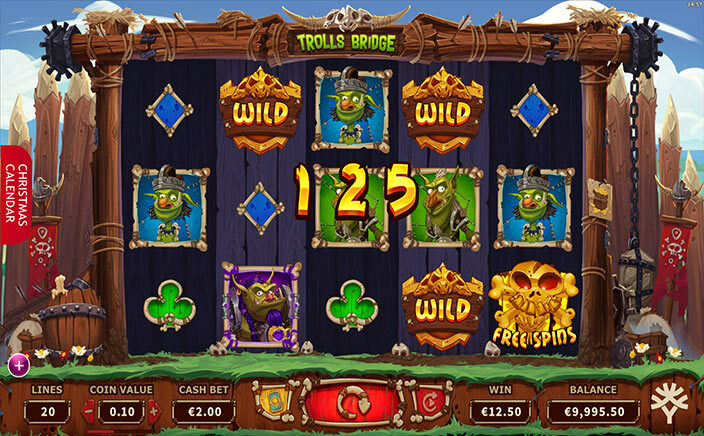 Yggdrasil has designed a fantasy-themed online slot namely Trolls Bridge. The slot features 5 reels, 3 rows and 20 paylines and steady gameplay. It is a medium variance slot which comes with plenty of action and bonus features. Trolls Bridge is turning out to be one of the finest slots with an RTP of 96.00% – 96.30%. Trolls Bridge slot will transport the players into the fantasy world that is based on the trolls. Playable on mobile, tablet and desktop devices, the slot can be played with the min and the max bet of £0.20 and £200.00 respectively. Four trolls act as the higher value icons that can be differentiated by colour such as blue, green, purple and red. At the same time, the lower values are represented by some beautifully crafted clubs, diamonds, spades and hearts. The wild icon is depicted by a gold ‘Wild’ that will substitute all the other icons apart from the scatter icons. Five scatter icons will yield ten free spins plus five features. Four scatter icons will yield eight free spins plus four features. Three scatter icons will yield six free spins plus three features. 2x multiplier for every win. 2 or 3 additional spins. One of the given trolls becomes stacked on all the reels. One of the given trolls transforms into the wild. A sticky wild at the centre of the reel third, fourth or fifth. 1 or 2 wilds on each spin. Golden Bet is an extra feature that can also be activated during this round. It will add about 25% to the player’s stake. Bonus Pot – It will occur only on the fifth reel within any base game. And, when it does, the players will get the coin reward of between forty and thousand or one of the above free spin options. Losing spin will provide a reward of between hundred and thousand coins. Winning spin will provide the multiplier ranging from 2x to 5x. 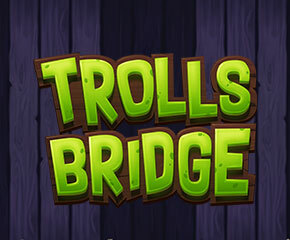 Trolls Bridge is a superb slot which offers a jackpot of 250x the player’s stake. Due to its entertaining theme and engaging graphics, the slot surely attracts a large audience.